So what have people been talking about at this year's IFA? From Panasonic's 'Digital Hearth' to Sony's new land of 'make.believe', we look at the buzzwords that have defined the show. Panasonic has coined this term to describe its approach to 3D TV in 2010. Its Full HD 3D System will be appearing in its 1080p 3D TV plasmas and Blu-ray players. 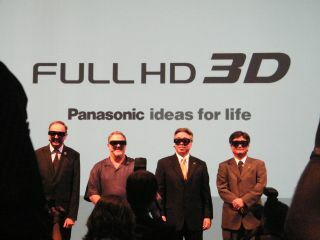 Panasonic's fingers will be firmly crossed that decent 3D content will actually be available next year to show it off. Pronounced 'make dot believe', Sony's new brand identity glues its product ranges together in a sandwich of "creativity and innovation". According to the press release: "'Believe' is the power of inspiration and 'make' is about crafting inspiration into products and experiences for our consumers. The 'dot' is the place where they meet – and where magic happens!" Yes, Sony is being completely serious. This is Panasonic's vision of a digital eco-system that's built around its Viera HD TVs. The idea is that you can seamlessly hook up a Panasonic HD Camcorder, a Panasonic Blu-ray deck or Lumix G camera to access your digital data. While new Viera Cast technology will pull internet feeds to your TV screen. It's not a new idea. Panasonic floated the concept at CES in January. Couldn't Philips just call its 3D TV plans '3D TV'? Of course not. That said, its Interactive TV tag does go beyond 3D to encompass the whole Philips home cinema experience. It includes the company's eye-catching 21:9 Cinema displays, its new Ambilight technology (now with more LEDs) and web connectivity via Philips Net TV. If a gadget hasn't got a touchscreen these days, we're just not that interested. Hence the arrival of the Squeezebox Touch, Sony's new touchscreen X-Series Walkmans and full-screen touch phones like the Xperia X2. IFA has also seen the launch of the JournE touch tablet from Toshiba (below). While 3D TV announcements have dominated IFA 2009, the technology isn't quite ready for prime time. Sony, Panasonic and Philips have all stated that 3D will be available next year, but are reluctant to say exactly when. Sony's 3D TV demos were based around a alternate frame sequencing display technology and required active-shutter LCD glasses to view the 3D effect. Unlike a passive solution (using cheap polarised lenses), the Real D active shutter system uses "a lens that blocks each eye very rapidly, alternating left and right in sync with the image being shown on the screen, which creates the 3D image in your brain." The good news: with active shutter glasses you get better, more realistic results than a polarised pair of specs. The bad news: active shutter technology is more expensive and requires batteries.